My relationship with "Wine Grapes" has only begun. No one, not even a winemaker with obsessive-compulsive disorder, will ever read this 1242-page hardback book cover to cover. And if they did, the book wouldn't be worth the $175 cover price. It might be fun to try. Start with Abbuoto, a "rare, central Italian variety producing plenty of alcohol, generally blended." On the same page there's Abouriou, a "declining, early-ripening southwest French variety making tannic red" that was once known in California as "early Burgundy." Then you learn that Abrusco, an "obscure and endangered late-ripening Italian red adding colour to blends," is made in a 100% varietal version by only one winery. Le Tre Stelle is a Tuscan farm, winery and B&B owned by two sisters and their mother, and when 20 vines of nearly extinct Abrusco were found by chance, they decided it should be bottled on its own. Don't you want to try that wine? Can you keep going? Can you go through Acitana and Acolon and Adakarasi? How long before you flip ahead to get to a grape you used to think was obscure, like Colorino or Inzolia or Scuppernong? 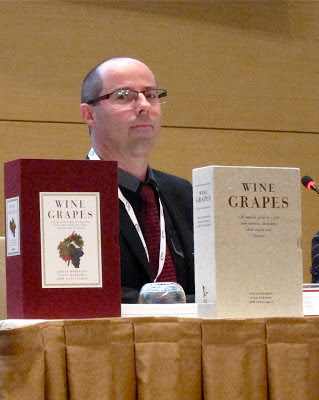 There are 1,368 grape varieties in this book, and wine geneticist José Vouillamoz gives the origin of each, along with surprisingly precise figures on where and how much of it exists today. Co-authors Jancis Robinson and Julia Harding help fill in the best producers, in case you really want to try a good bottle of Grk or Krstač or Trincadeira das Pratas. More important grapes get more pages. To a geneticist, Pinot Noir, Pinot Gris and Pinot Blanc are the same, yet the Pinot family gets 20 pages and a foldout chart. We don't know where it came from; the leading theory is that it was a domesticated wild grape from northern France, where it was first described in the 1200s. But we do know Pinot and the promiscuous, now-outlawed Gouais Blanc gave birth to Chardonnay and Gamay, as well as 19 other lesser-loved progeny. I find it less fascinating to read about important grapes like Syrah (a natural crossing from France) than to browse through grapes I've never seen on wine labels: Swenson Red, found in Minnesota, Iowa and Poland. Moradella, a northern Italian grape that growers like, is not officially allowed in DOC wines, but it's Italy, so they put it in anyway. Korinthiaki, a Greek grape that you've eaten many times as a California raisin, used to find its way into California wines during small vintages (bet it still does). I just love leafing through this book. If you know somebody who would find the previous paragraph interesting, they probably would too. Read my interview with José Vouillamoz on Wine-Searcher. I like the charts, finding out Cot (Malbec) is the great grandfather twice removed of most of the Bordeaux reds was interesting, it was thought to be an old variety but sort of contemporary to Cab Franc not its Great Grand Father. It’s in the genetics, eh! Wonderful book, but I would like an eBook version also, it’s too heavy to hold so I have to sit at a table to read it. It and the Oxford Companion in eBook version would be great to have immediate access to information, but I would still own the 5kg versions as well.